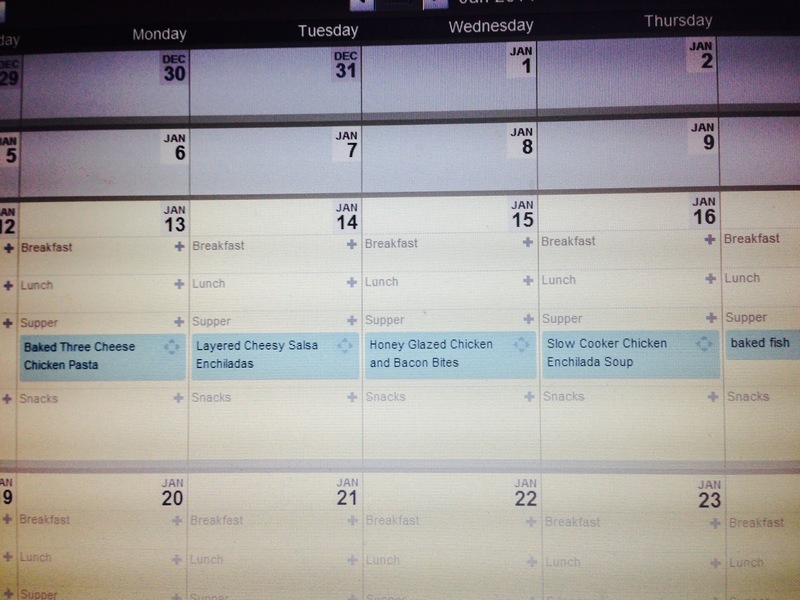 Today at weight watchers we were challenged to plan out our meals for the week. That is something I am pretty good at. I am now using an online program called Plan to Eat. Now to start - it is not free. But is worth every penny I pay. I think it is $30 - $40 a year. I make that money back in the time that I save with planning. I can even pull up the recipe on my Ipad to cook my recipe for the evening. You can try it free for 30 days right now. Just click the link below and it will take you to their site. I started with the 30 day free trial. Then I found out it makes my life easier so I started paying. I put all my recipies into this program and have for two years. I get most of my recipes from different blog sites that I follow and tweak them to meet my families needs. I can take the url of the recipe I have found off the blog and put it into the recipe and most of the time (not always) it transfers everything into my recipe book. If it does not directly transfer, I can easily copy and paste into the recipe. I can even get the html code and directly put it into a post on my blog. LOVE!!!!!! On the left hand side are all my recipes. The rest of the screen is my meal planning calendar. 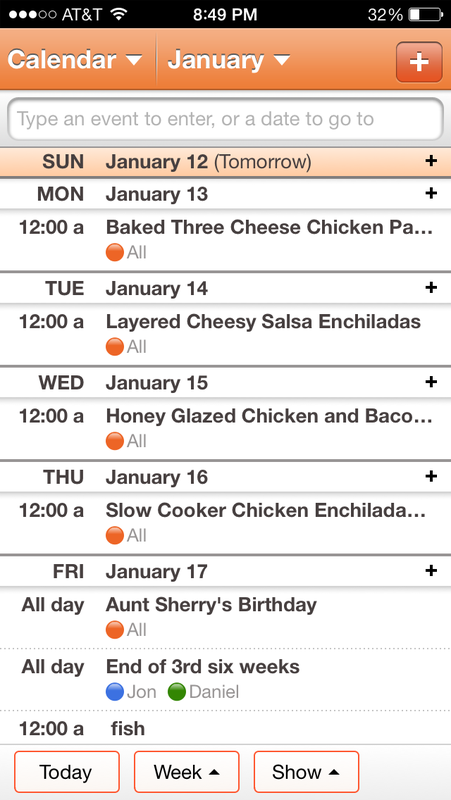 This is how easy planning is - I click the food and drag it to the day I want to prepare that meal. It is really that easy. If I am using recipes in my planner, I takes me 5 minutes to put in my meals for the week. No more trying to think and come up with meals for the week. I choose off my list. Today, I put in 3 new recipes I am wanting to try, so it took 10 minutes which included looking for the recipies, inputting and planning. When I finish it looks like this. I could put in my breakfasts, lunches and snacks if I chose to. I don't do use those because of the another feature I love (see below grocery list). It will even make a grocery list. I can access that list from my phone or print it out. My choice. I love a digital form - so I don't lose my list. From my computer, I take off the items I do not need to buy that week. 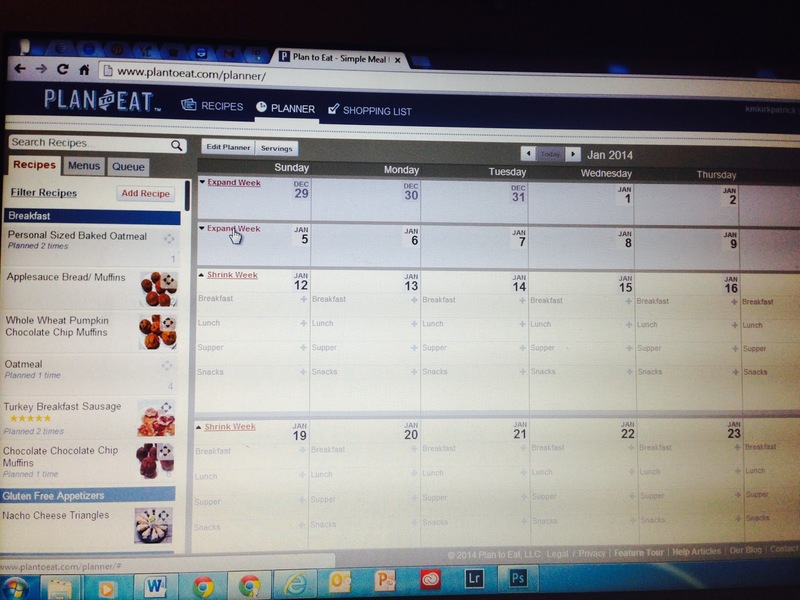 Now for a feature I really, really, really LOVE> I have it set to sink with my Cozi calendar. Before I leave for work, I can review what it is I am cooking for that evening. I hate leaving wondering what I had planned earlier. The reason I do not put in breakfast and lunch is that would also sinc with Cozi and that is too much info for me. So I choose not to use it. My snacks are mostlyfruits and veggies with occasional cheese sticks or almonds. My breakfast is one of 3 things, it is not necessary. So get planning. You don't have to have this program, it is just how I do it. I've looked in to Cozi and have had the app for almost a year. I've done nothing with it... I had no idea it had that kind of power. Is that the free one or a premium that you pay for? We use the free version of Cozi for so many things. So far it has everything we need. The boys can go in on their phones and add stuff to my grocery list. Each person has a to do list that we use. One of the things we like best is the ability to send notifications of appointments to each persons phone. I tried the paid version for a couple of months - it was not worth the money so I switched back. you know that the paid version of Cozi (19.99) has a recipe box that adds to a grocery list in the cozi app as well. I was wondering if this would work as well as the plan to eat,which is how I found your blog.